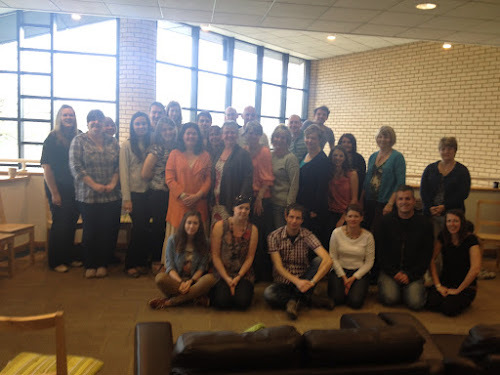 Today we said goodbye as a staff to the wonderful Val Pocock. For nearly 16 years Val has been one of our amazing receptionists, and she is now starting a well deserved retirement. To be honest I don't think it will be long before she's back volunteering in a variety of different roles, but hopefully for at least a few weeks Val will enjoy not having to get up quite so early every day! Val has seen incredible changes since she first came on staff. Initially most people coming into reception were coming in to use the bookshop. Now that has been more than replaced by the hordes coming in for Sparklers, Foodbank, CAP, Crisis Intervention and for many others reasons. Through it all Val has been brilliant at making everyone coming in or phoning feel valued, welcomed and connecting them with the right person. She will be greatly missed. Next time you see Val please thank her for her years of service and congratulate her on her retirement! This Sunday we've got a gift day towards finishing paying for the reception and auditorium redevelopments we did last year. We're looking to raise at least £45,000 to pay back interest free loans which need to be repaid by the end of March. In total we need to raise £173,000 to repay all of the loans. I know that it can feel daunting when we see these big figures, and then think about how much we personally are able to give. Sometimes that can leave us thinking "what's the point in giving". Well I want to encourage everybody to give something. There will be some who can give big amounts, and others who may only be able to give £1. That's ok. Paul wrote to the church in Corinth to "set aside a sum of money in keeping with your income" and I want to encourage you to do the same. 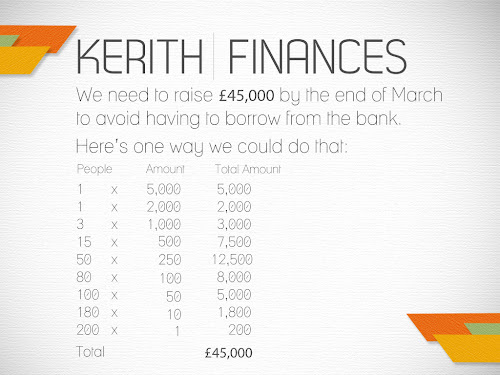 The chart below shows one way we could raise £45,000. Please take a moment to prayerfully have a look at it and think how much you are able to give. Let's see what God will do with us in this gift day, my prayer being that we raise well beyond the £45,000 so that we can start work on the next very exciting things God has in store for us (more on this soon!). I'm writing this from a service station just outside Nottingham (the joys of free wifi!) on my way up to the Abundant Life Church Stronger leadership conference. Quite a number of the staff and Academy students are coming up too so it should be a good few days. After the conference finishes Catrina and I are staying up here until Sunday as I'm preaching at The Light church in Bradford, which was started in 2008 by amongst others our good friends John Kirkby and Matt Barlow from Christians Against Poverty. It will be my first Sunday away from Kerith this year, and I'm gutted to be missing the baptisms, but I'm looking forward to it too - please pray for me to speak well! Hope you're having a good week, and remember however it's going to rejoice always, pray continually and give thanks in all circumstances. A couple of weeks ago I wrote that we’re currently recruiting for someone to be part of our Reception team as a part-time volunteer. The role covers 3 morning sessions each week (Tues, Thurs, Fri) from 9am-1pm. Having given first priority to anyone willing and able to volunteer in that capacity, we’re now able to offer the role as a paid position. If you, or someone you know, would be interested in finding out more, there are information packs available in Reception, and a job description is linked here. You can ask any further questions, or apply for the role itself, by getting in touch with sue.ranger@kerith.co.uk or ali.hudell@kerith.co.uk. They’re looking forward to hearing from you! Finally, please note that the closing date for applications has been extended to Friday 30th March. It's funny how God links your heart with other nations. Ten years ago I'd have struggled to show you where Albania, Lithuania or Zambia were on a map, or tell you anything about any of those nations, yet now I feel a deep connection with each of them - I even got excited when Zambia won the Africa Cup of Nations! Many of you will know that Sam and Hannah Fairs-Billam have just moved with their two young girls out to Lusaka, the capital of Zambia, to spend a year working for the Evangelical Fellowship of Zambia helping them to develop a child protection policy. If you haven't done so already I'd really encourage you to sign up for the email updates on their blog so you can keep track of how they're doing, and keep them in your thoughts and prayers. Hopefully most of you will also know of the HIV/AIDS project we're involved with in Serenje, a rural community in Zambia. Zoe Hayes, who oversees the project from a Kerith point of view, keeps a blog where she posts regular updates as to what is going on. You can find that here. Rest assured that we're also still progressing with the plans to build a dormitory for 100 girls in Serenje. At the moment the plans are going through their planning apporval process, work has started on finding the right contractor to build the dormitory, and the churches out there are working on a sustainability plan to show how long term the dormitory can be funded and kept running. The plan is still to get the dormitory built in time for girls to move in for January 2013, which is the start of their school year. Many of you will know that for the last couple of years I've been writing a book, which I've titled the Peach and the Coconut. It is an attempt to write a word description of the culture we are trying to develop at Kerith, based on a comparison of the culture of the Pharisees and the culture of Jesus. The intention is that it will be a book to guide and shape us as a community, rather than being written for any sort of wider audience. Well last Wednesday I managed to complete the first draft of all 32 chapters. I know that many of you are far more accomplished writers than I am, but for me it feels like a major achievement. In total it is about 52,000 words, which seems like a ridiculous number, and when turned in to a book will apparently be about 200 pages long. Included in with the book will be a number of life stories from people in our community. We're now at the very scary stage (for me at least) where it's been given to a number of people to review and comment on. I fluctuate between thinking it's OK, and thinking I've spent the last two years writing complete nonsense, so I'm waiting to get their comments back with much fear and trepidation! The plan, unless of course the feedback is to scrap the whole idea, is to spend the next month or so working on and improving the text alongside a professional editor, and then for us to get it printed ready to be given out to all of you in September. We'll also make it available for Kindle and other ebook readers, and may also make it available for people outside our community to buy if they'd find it interesting or helpful. I do believe the whole book idea was something God prompted me to do, and that it will be a useful tool as we look to grow and develop as a community. For now I'm just enjoying not having the pressure of thinking "I've got to get at least one more chapter written this week!". This Sunday we're going to be celebrating Mothers Day in all three meetings. We're going to be hearing the stories of three different women in our community, the children will be singing at the start of both the morning meetings, Lydia Harris-Lane will be preaching and there will be the opportunity after all three meetings to have your photo taken (these will then be posted up to a website afterwards where everyone can see them and they can be downloaded). I realise that for some Mothers Day is a great celebration but that for others, for a whole variety of reasons, it can be one of the hardest days of the year. Whichever group you're in, and some of us fit into both, then I strongly encourage you to come along for what will be a faith filled, reality acknowledging series of meetings. I also know that lots of people are also bringing guests. If you haven't done so already please be thinking about who you can invite along to what for them could be a life changing event. 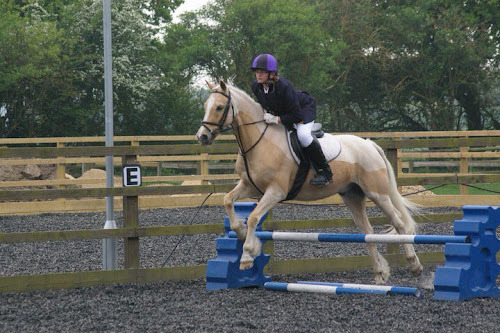 This photo is of our daughter Alice riding at Oakwood Youth Challenge. Tony Pudner who runs Oakwood is currently looking for a Centre Manager to run the Stable Yard - you can find a job description here. If you don't know about Oakwood then I'd really encourage you to have a look at their website, and see all the great stuff the team there are involved in. The riding centre has gone from strength to strength over the last couple of years, but with Caroline who has done a great overseeing all the growth stepping down to have a baby, it now needs a new leader to take it to the next level. At the end of this month the wonderful Val Pocock will be finishing her job as our morning receptionist and starting a well earned retirement (although knowing Val I'm sure she won't be able to keep away for very long!). Val has done an amazing job for many years now welcoming the growing number of visitors into the Kerith Centre, whether it is speaking to people and answering queries on the phone, welcoming clients for our community work like Foodbank, or greeting visitors to the office team. First impressions are so important, which is why we put so much effort into having an inviting reception area, and making sure everyone gets a greeting from our team that says “We're really pleased you're here”. We’re currently recruiting for someone to be part of that welcome by joining our Reception team as a part-time contracted volunteer. The role covers 3 morning sessions each week (Tues, Thurs, Fri) from 9am-1pm and starts on Tuesday 3rd April. If you, or someone you know, would be interested in finding out more, there are information packs available in Reception, and a job description here. If you have any questions, or want to speak with us about it, please get in touch with sue.ranger@kerith.co.uk or ali.hudell@kerith.co.uk. But hurry – we want to hear from you by 15th March if so! If we can't find someone willing and able to do the role on a volunteer basis then we will look to recruit somebody on a paid basis. However, we felt as part of our goal to raise the level of volunteering across the church to see if there is a wonderful person willing to do it as a volunteer! As part of the preach I'll be interviewing somebody from our community who has experienced the reality of these verses in the most remarkable way. Please get there if you possibly can, as it's going to be another powerful time together. And if you missed Tim Hughes last Sunday then make sure to catch him on the podcast - he was outstanding! Just a reminder that Tim Hughes is preaching with us on Sunday morning, speaking on our next Texts for Life verse John 6:63 - "The Spirit gives life; the flesh counts for nothing". Worship will be lead by our wonderful regular band (who are all slightly freaked out at the idea of preaching with Tim here!). Hopefully we'll get Tim to come back at some point in the future to lead worship for us too! Hope to catch you on Sunday morning, and in the evening for our Volunteer Oscars - it's going to be another great Sunday.